Chris Anderson’s Long Tail idea is that in a (nearly) frictionless environment like the Internet, the margins of commerce (ideas, products, etc) can collectively provide as much (or more) interest as the Top 10 or 20 ideas or products that dominate the headlines and balance sheets. Digital media like music follows this formula best, but as distribution methods (think Twitter) get wider and wider and the cost to mass customize a product shrinks, new product areas are emerging that aren’t quite like the digital media world yet behave that way on the internet. 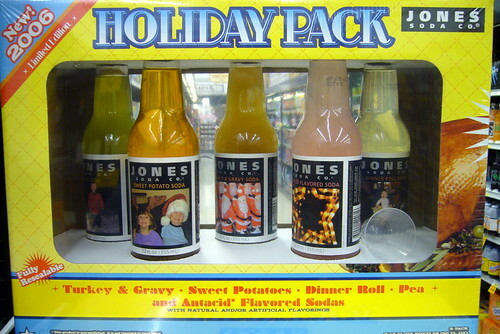 I think that the Jones Soda Thanksgiving Flavor 2006 Holiday pack was definitely one of those products and ideas that has gotten better over time. True, the soda was kind of disgusting. The Limited Edition page captures the essence of the marketing idea — making buzz with fizzy suds — but misses out on the other opportunities presented by the medium in my opinion. If a picture of a six pack of soda is driving the most visitors to my Flickr page and you can’t even buy that product any more, I think you’ve got a successful meme. Other marketers have used this “limited edition” cache in recent years with digital goods (think Office Depot’s brilliant campaign Elf Yourself, by the JibJab folks, as a way to take advantage of a limited time offer while still building a future following), but Jones is missing the gravy boat, I think, by discontinuing the popular Thanksgiving pack. So the next time you find yourself thinking about some goofy internet idea that you just can’t seem to let go of, think of the parts of your own business or service that present an indelible, show-stopping brand and make your offering more like Turkey Soda. Well, at least as memorable as Turkey Soda. Previous Post What Does LinkedIn have to do with Facebook? Yes, I remember those outrageous flavors. Last year’s Jones Soda Halloween line was also really good…candy corn and black licorice flavors which my kids loved, especially the later that made their tongues black. I wonder what they’ll come up with this year? That is one soda I would love to do a product review for on my blog. I didn’t realize it was discontinued. That’s too bad. It was pretty awful (my review here: http://kooztop5.blogspot.com/2011/11/top-5-best-thanksgiving-flavored-sodas.html), but I might buy it again if I came across it.